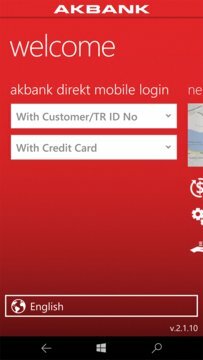 Bank wherever and whenever you like with the specially designed and exceptionally user-friendly Akbank Direkt Mobile app now available on the Windows Store! Akbank Direkt Mobile app offers you a unique banking experience with its personalized main page accessed conveniently with a single password. It is also the first app in Turkey that allows you to log in with your credit card information. Transfer funds, review the day’s transactions, apply for loans, pay bills... All that and more are at your fingertips with Akbank Direkt Mobile. If you enter your client number, user name and Akbank Direct password the first time you use the app, you can log in with just your Akbank Direct password at subsequent uses. Or, you can enter your credit card number, card expiry date and card password at initial access to continue logging in later with no more than your credit card password. 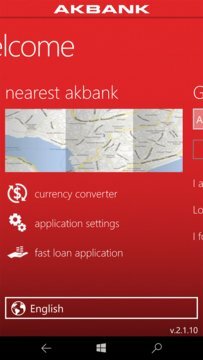 Additionally, you can take advantage of the app’s Nearest Akbank and foreign currency calculator features even if you are not an Akbank client.